Cabbage of any type probably has one of the worst reputations - if not in fact the worst reputation - of all vegetables. The saddest part by far about this reputation is that it is very often justified. 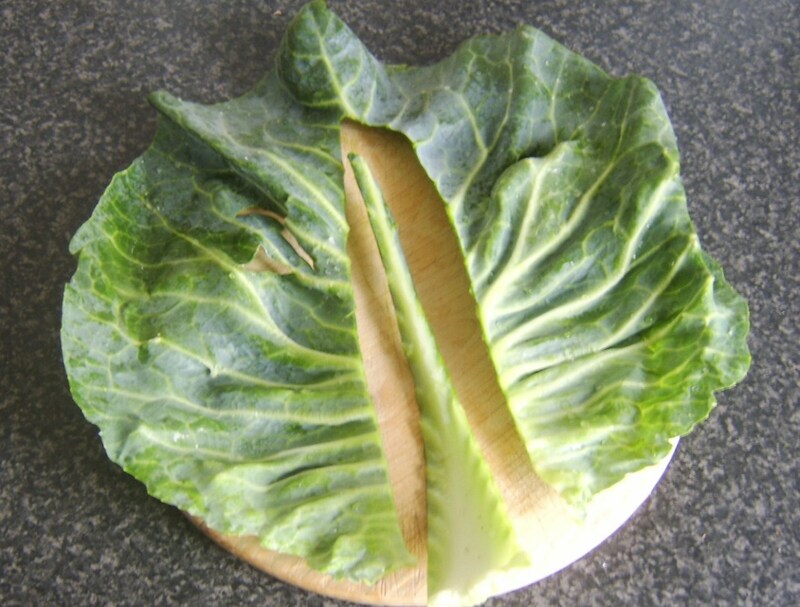 Most people can relate to cabbage which has simply been boiled in water for an excessively long period of time, causing it to look revolting, take on a most unpleasant and slimy texture, smell like a pair of socks that have been worn for a week and taste - at best - of nothing. 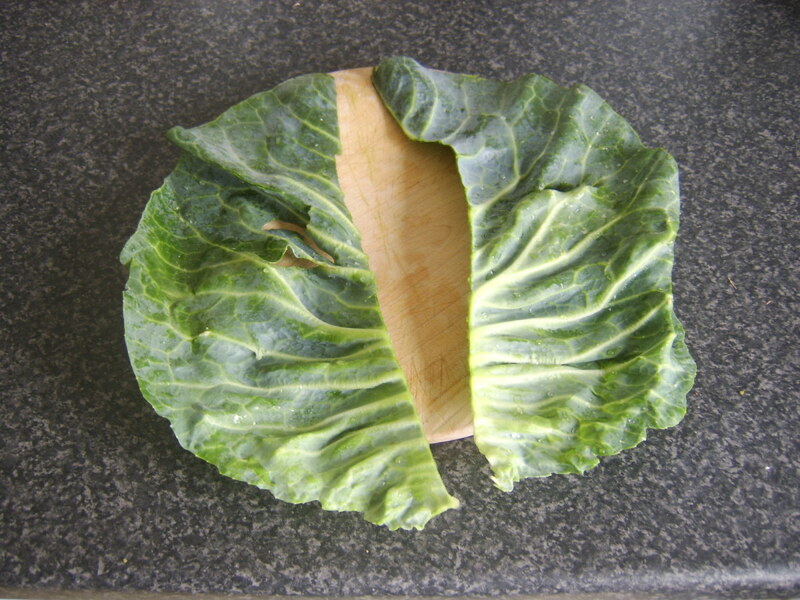 The good news is that cabbage absolutely need not be like this and when cooked and served appropriately, it can be both delicious and nutritious. 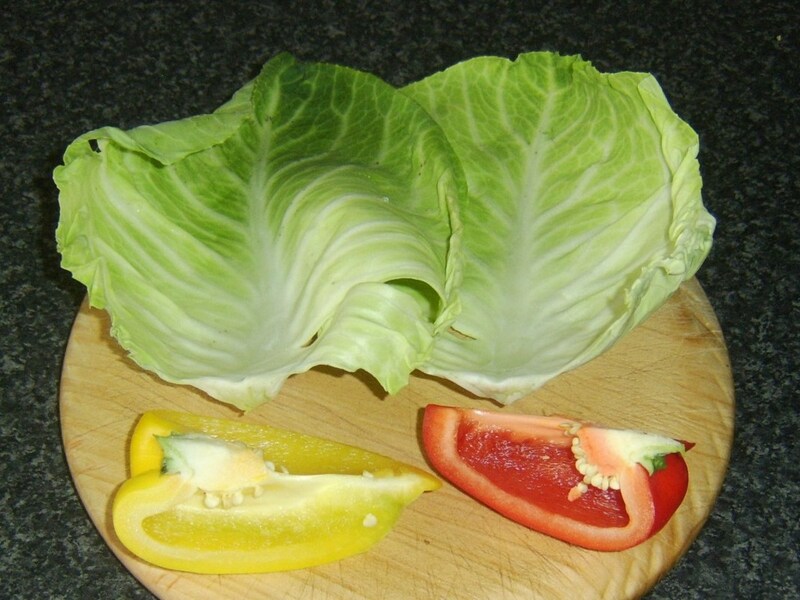 This page is devoted specifically to sweetheart cabbage (also known as pointed cabbage), showing how to cook it by sauteeing that it knows a beautiful appearance, texture and taste. 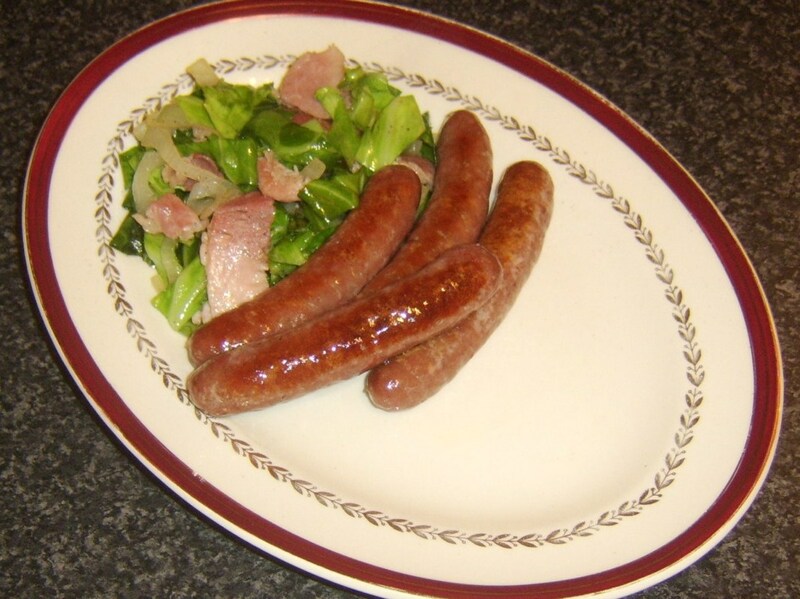 A variety of serving suggestions are also provided, though the sauteed cabbage element of each dish can obviously be served in any way you personally choose.. 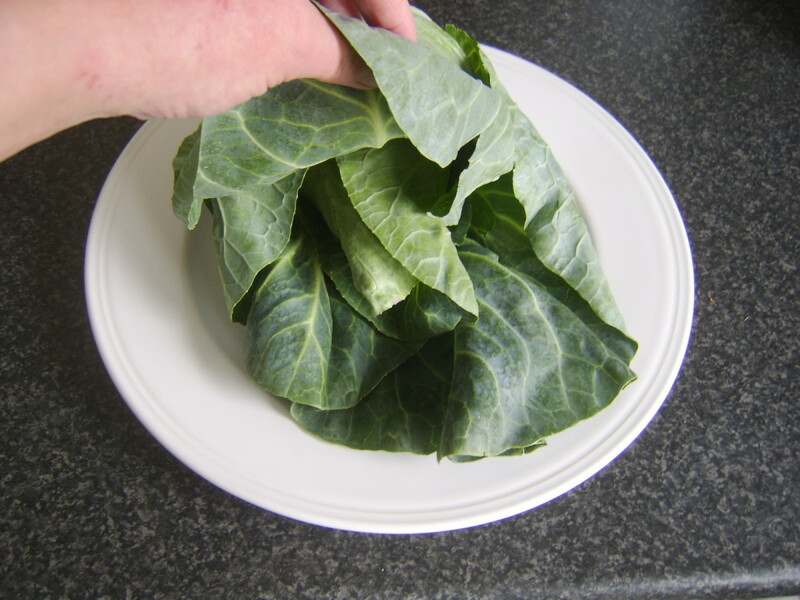 The leaves from a sweetheart or pointed cabbage - just like any cabbage - should be removed one at a time, carefully so as they are not torn. 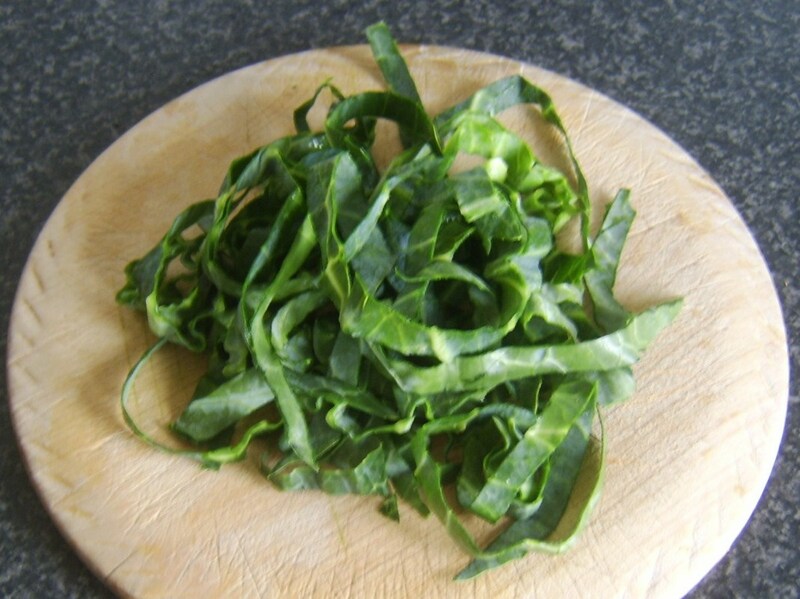 They should be washed thoroughly in cold water, noting that the outer leaves in particular may actually still have some soil attached. 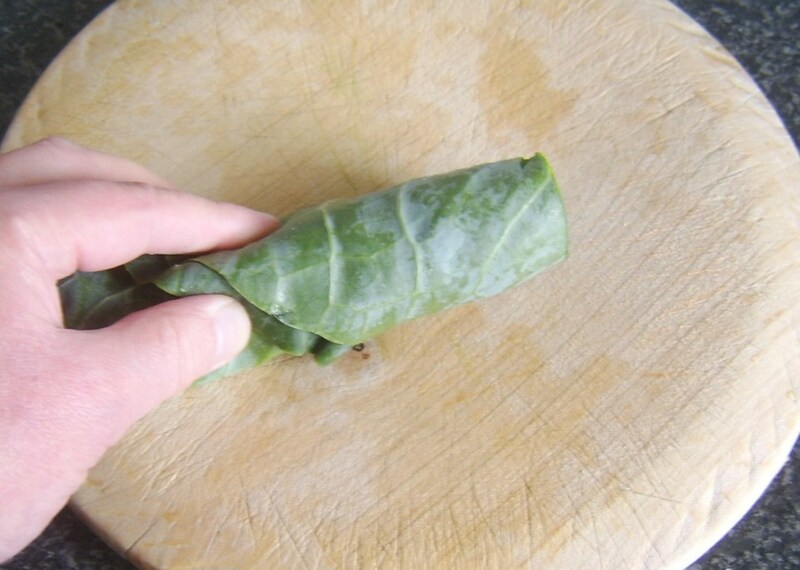 You will see a thick inner core to the leaves, shaped almost like a very narrow triangle. 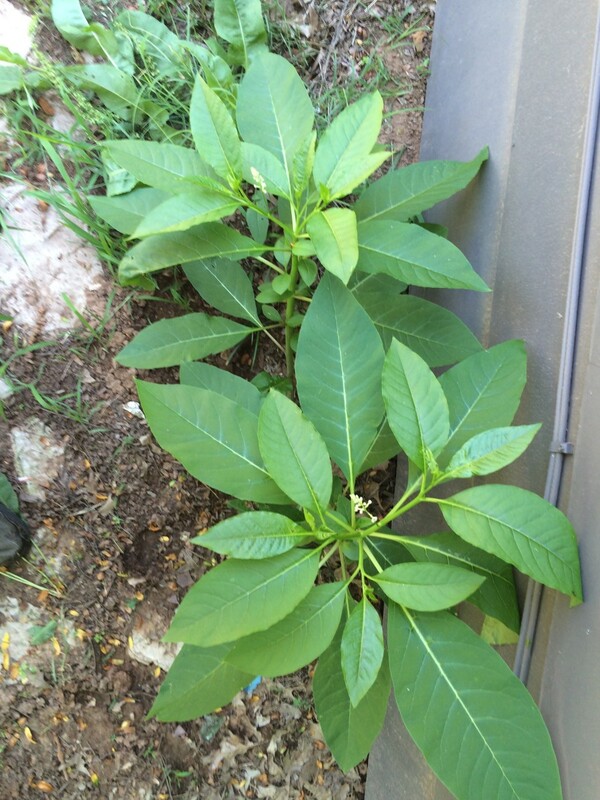 This core is extremely tough, especially in the larger outside leaves. 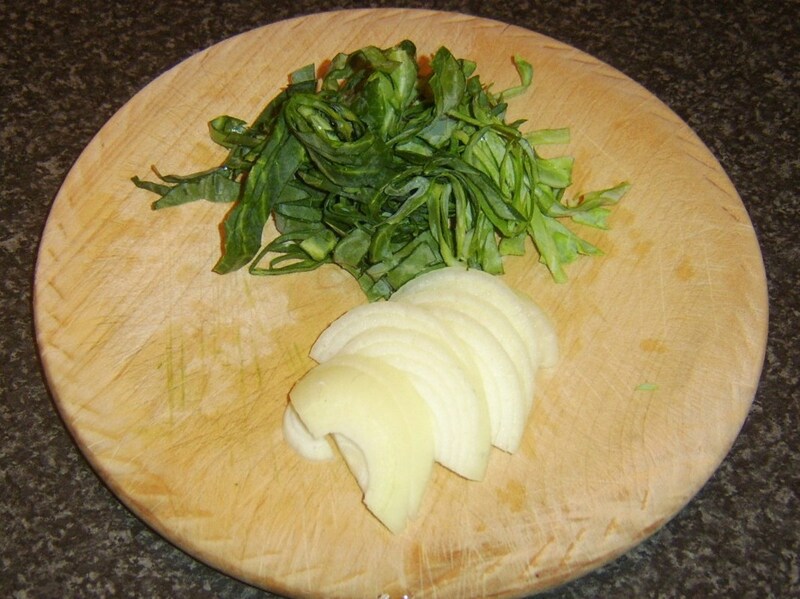 It should be carefully cut out and removed by laying the leaf flat on a chopping board and using a sharp knife. 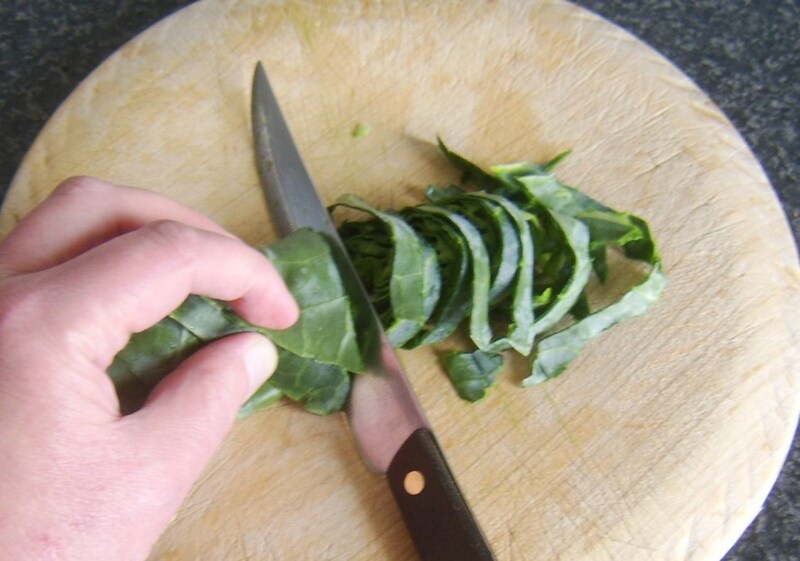 After the core is removed, cut the leaf fully in half and lay one half on top of the other. Roll like a cigar and then slice across the way. Separate the strands of each disc and your cabbage is ready for sauteeing. 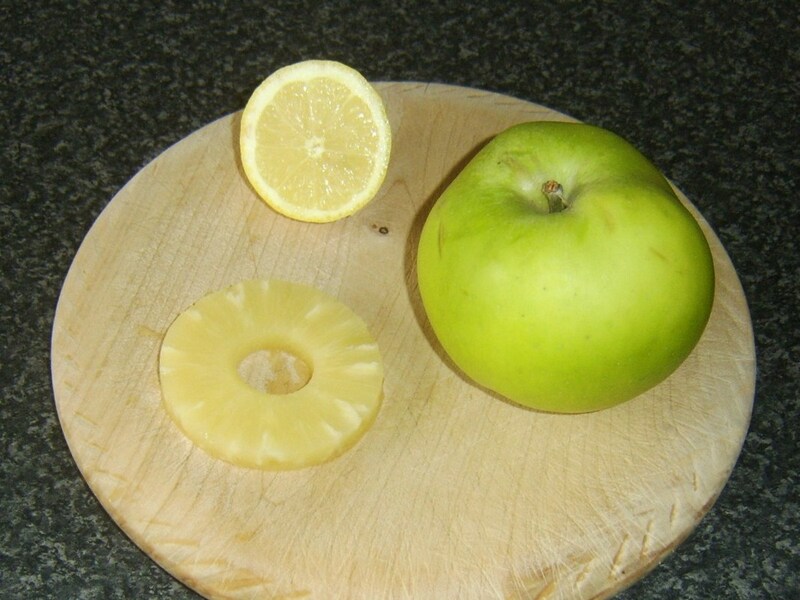 Put the apple, pineapple, pineapple juice, lemon juice and sugar in to a saucepan. Sit the pan on a fairly high heat, stirring all the time with a wooden spoon, just until the juice begins to simmer. 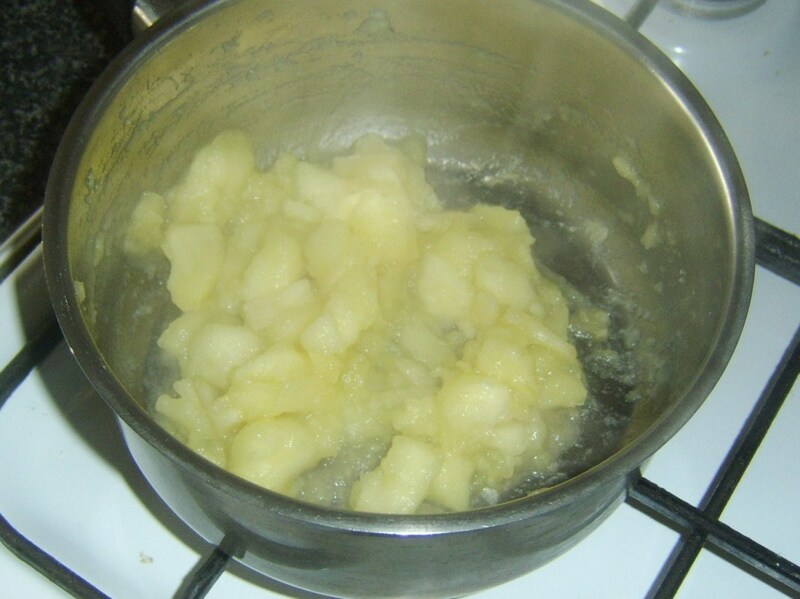 Reduce the heat and continue to simmer and stir for three or four minutes, until the juice is largely evaporated and the apple pieces are just starting to break down. Turn off the heat, cover and set aside to cool slightly while you prepare the rest of the ingredients. 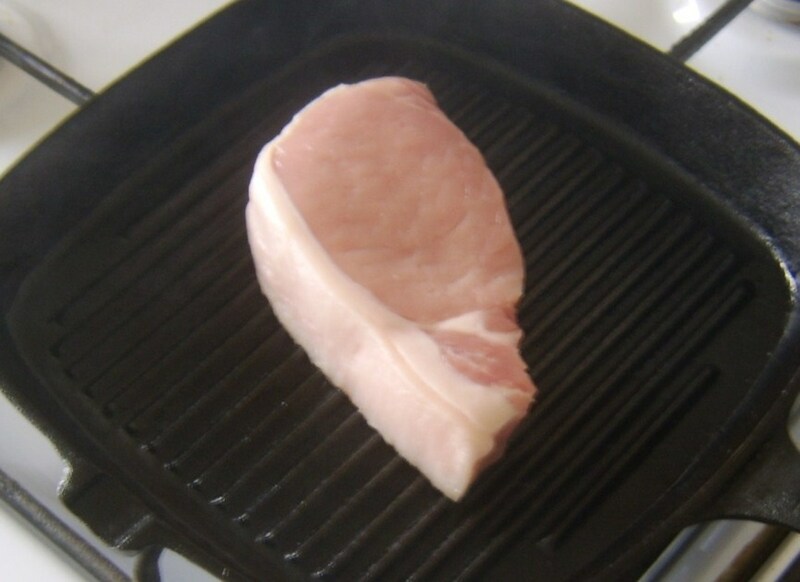 Start your griddle pan preheating on a very high heat. 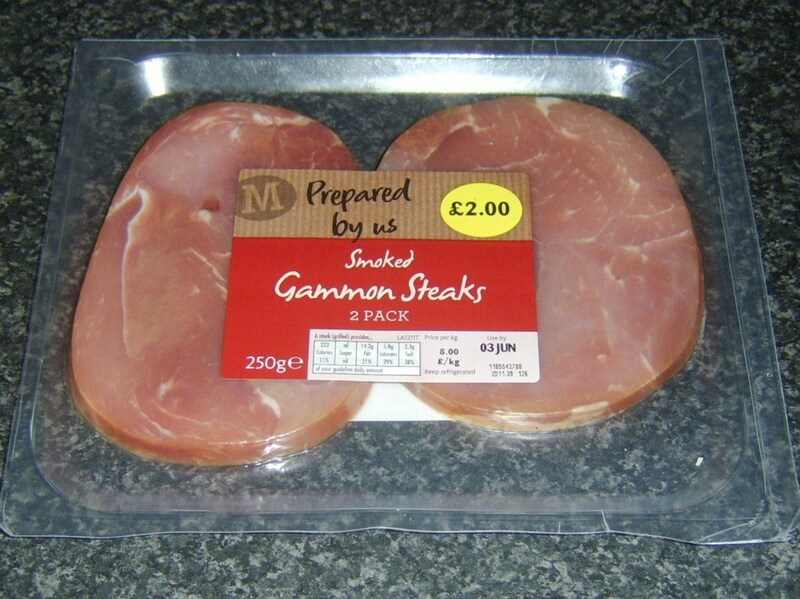 It must be smoking hot before you add the gammon steaks. Do not oil the griddle pan. 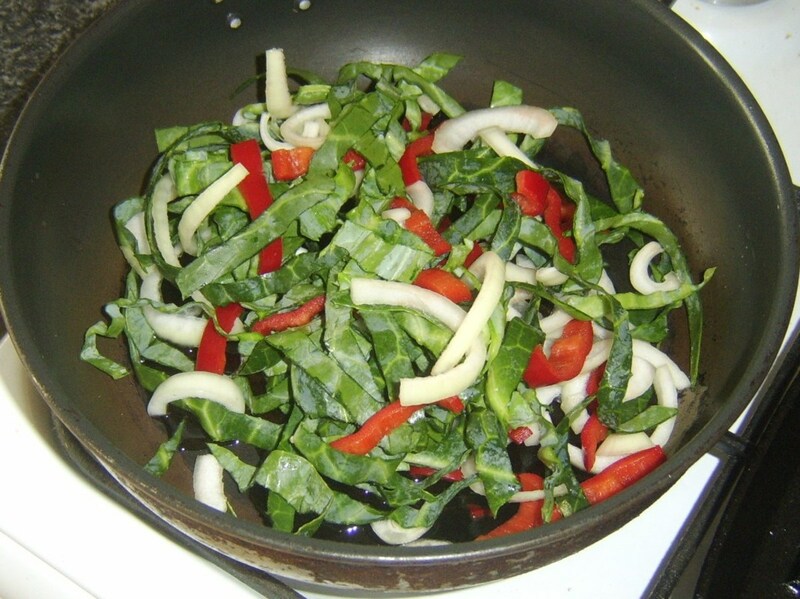 Pour a tablespoon or so of oil in to a non-stick frying pan and bring up to a medium heat and add the cabbage and peppers. 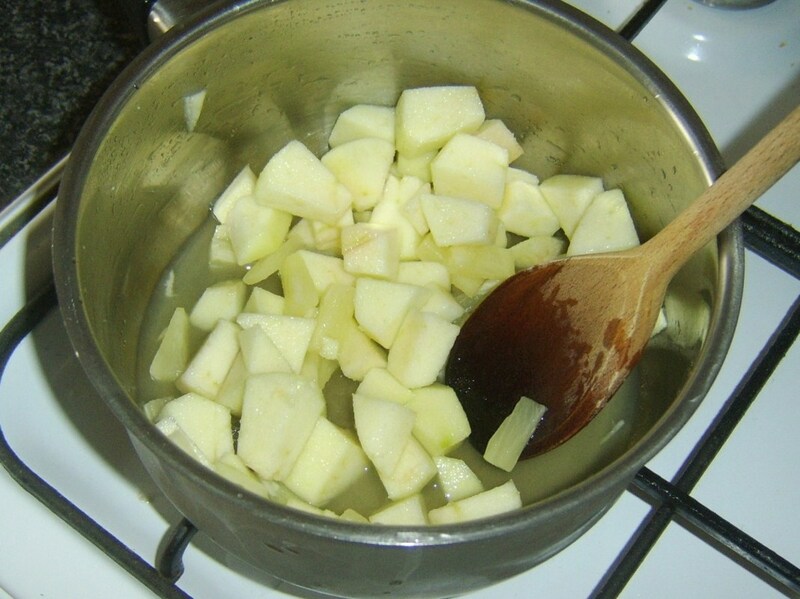 Season with salt and pepper and sautee for three or four minutes, stirring extremely frequently. 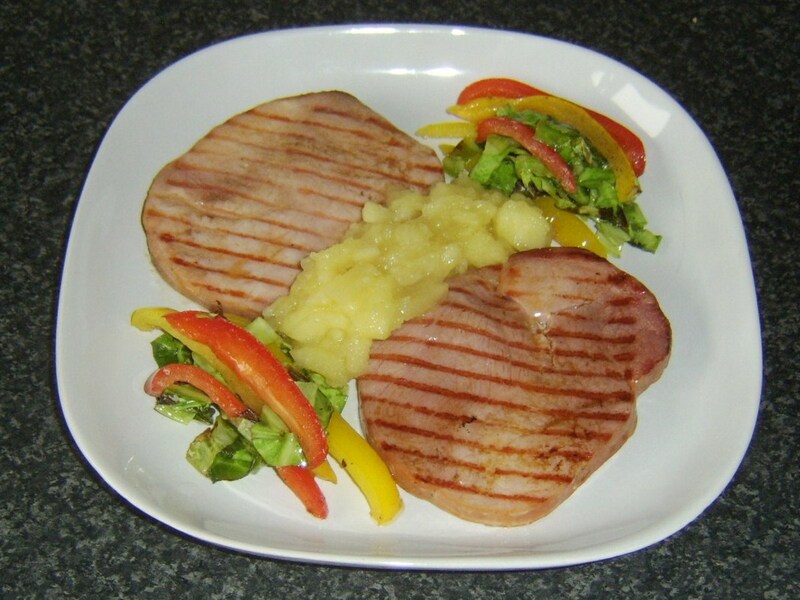 Use a pastry brush to brush the gammon steaks with vegetable oil. 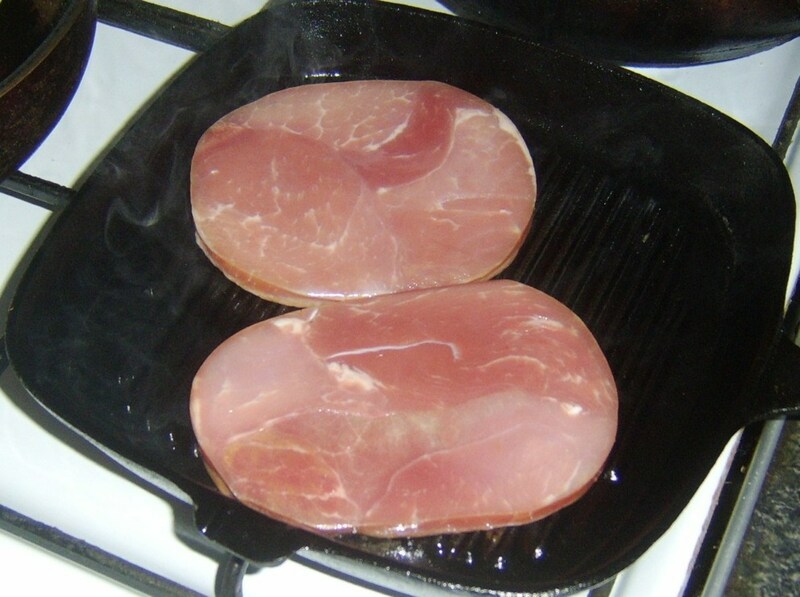 Lay them carefully on to the smoking hot griddle with cooking tongs. (Depending upon the size of your griddle, you may have to cook them in two batches) These steaks took only about a minute each side but the thickness will make this determination. 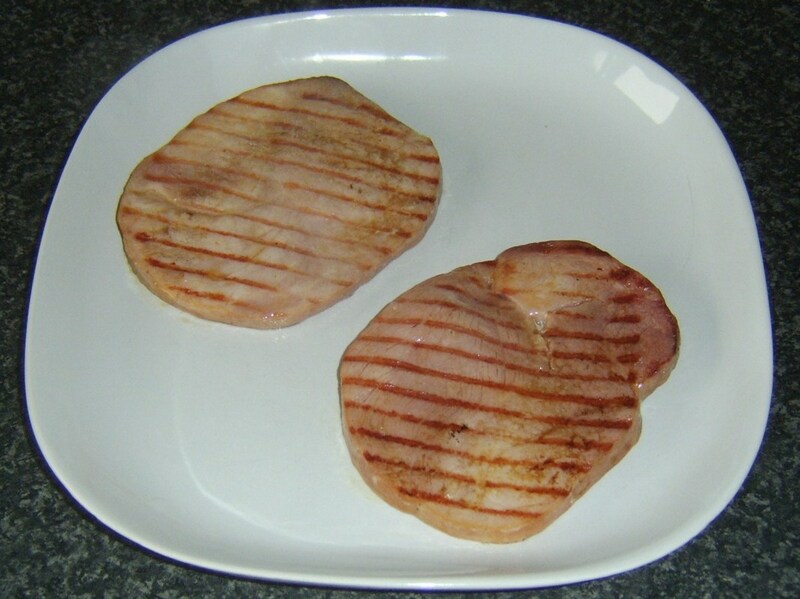 A good idea is to look at them from the side and judge when they are cooked halfway through. They should then be turned to cook for the same length of time on the second side. 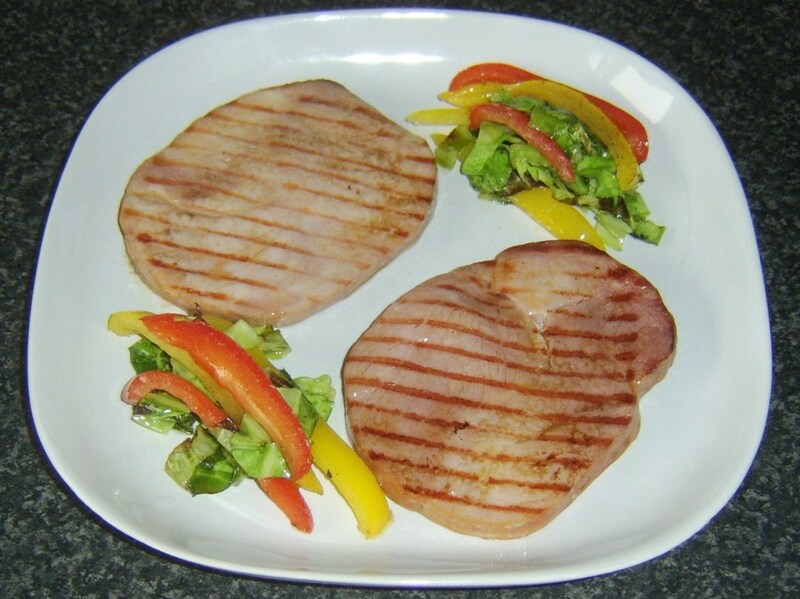 Lift the gammon steaks to a serving plate. 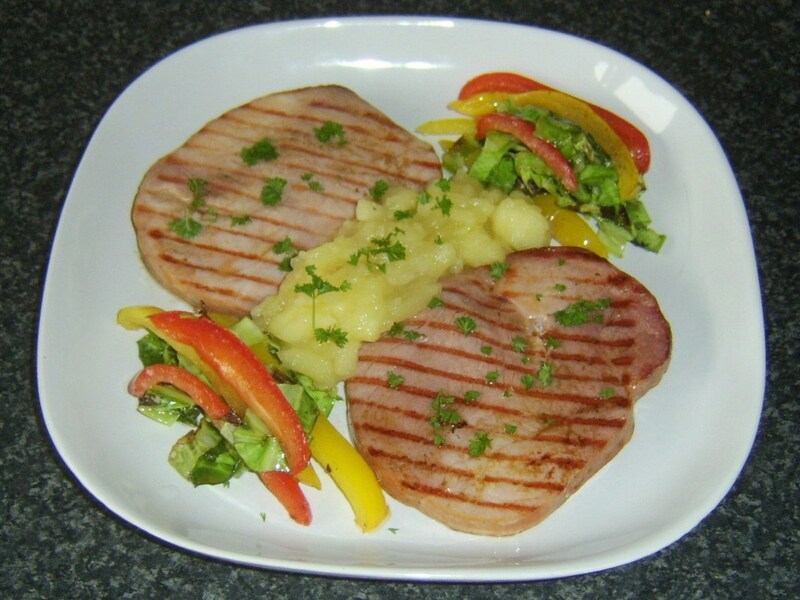 Arrange the cabbage and peppers alongside before spooning on the apple and pineapple sauce. 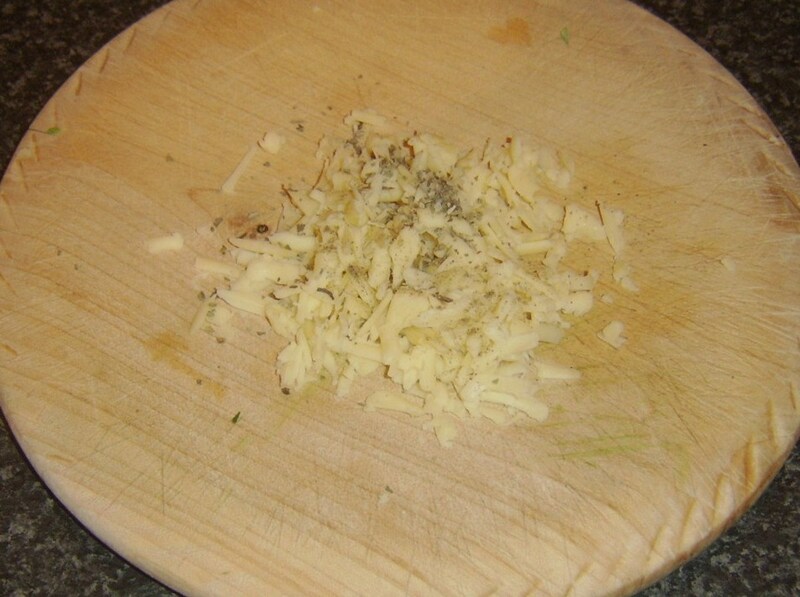 Finish off with the chopped parsley garnish. 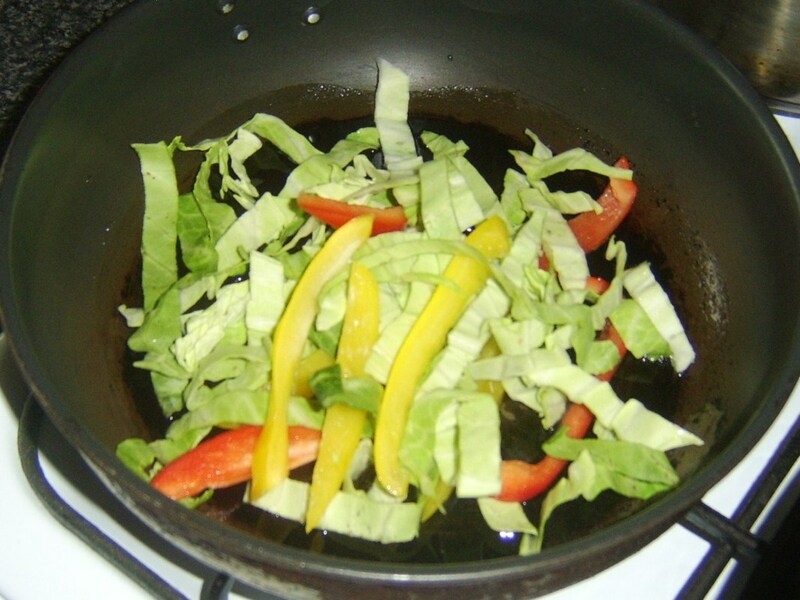 Pour a couple of tablespoons of vegetable oil in to a small to medium frying pan. 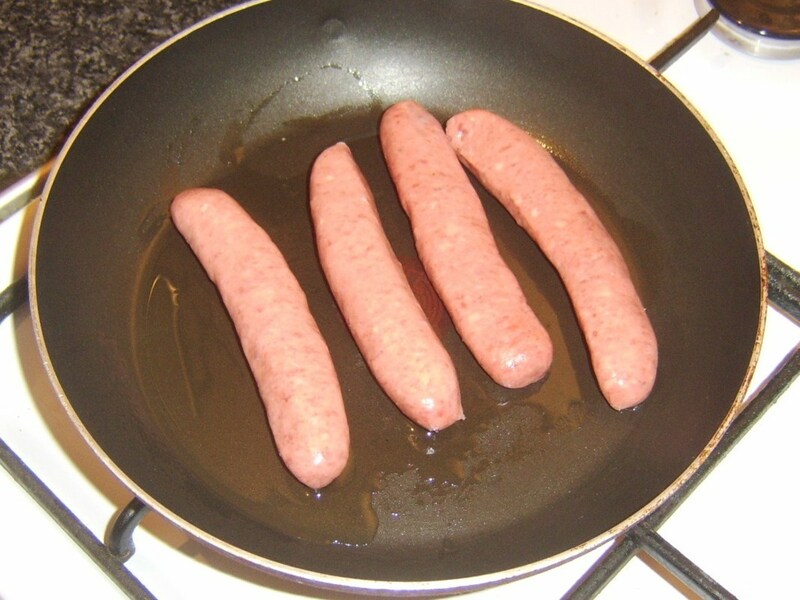 Add the unpricked sausages and cook on a very low heat for fifteen to twenty minutes, until the sausages are done, turning them frequently. 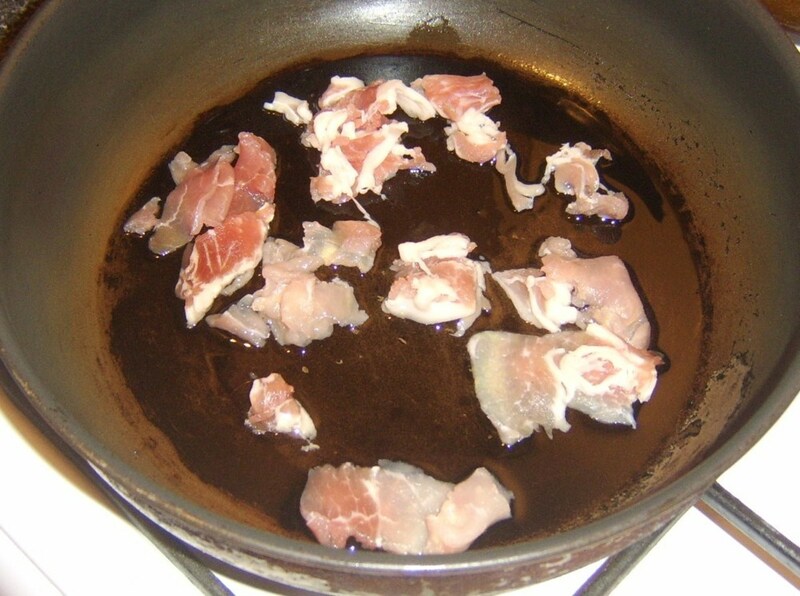 Add a similar amount of oil to a second, slightly larger pan and fry off the bacon pieces for about a minute until sealed all over. 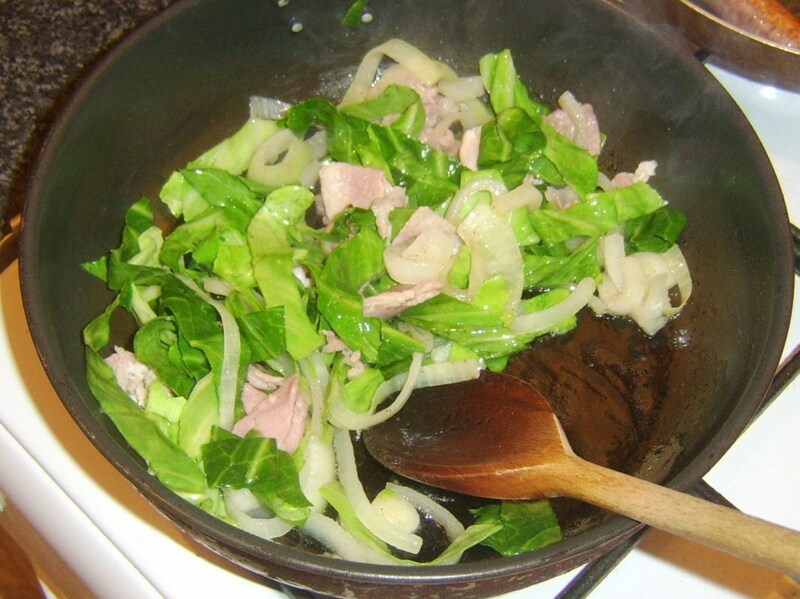 Add the cabbage and onion, season with black pepper and sautee for three or four minutes more. 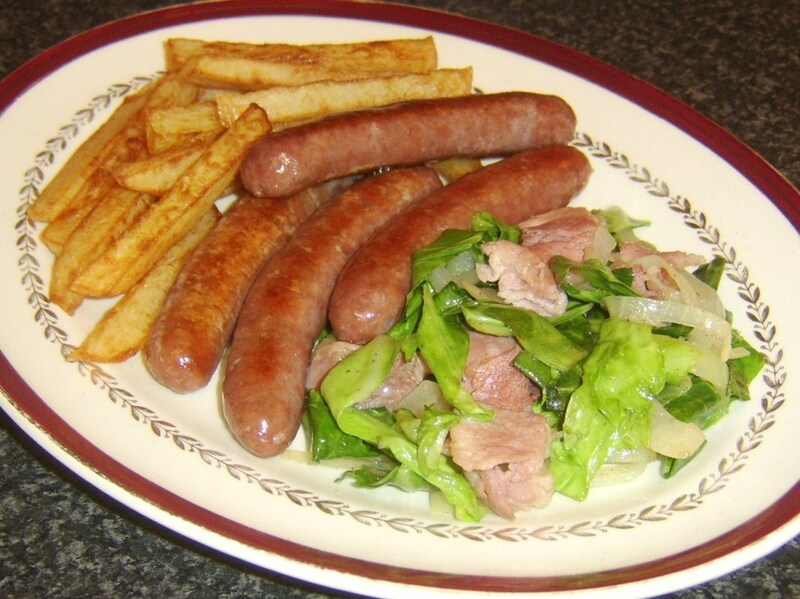 Plate the sausages with the sauteed cabbage and bacon on one side and the freshly made chips on the other. Liking these Recipes So Far? Please give them your personal rating using the star indicator to the right! 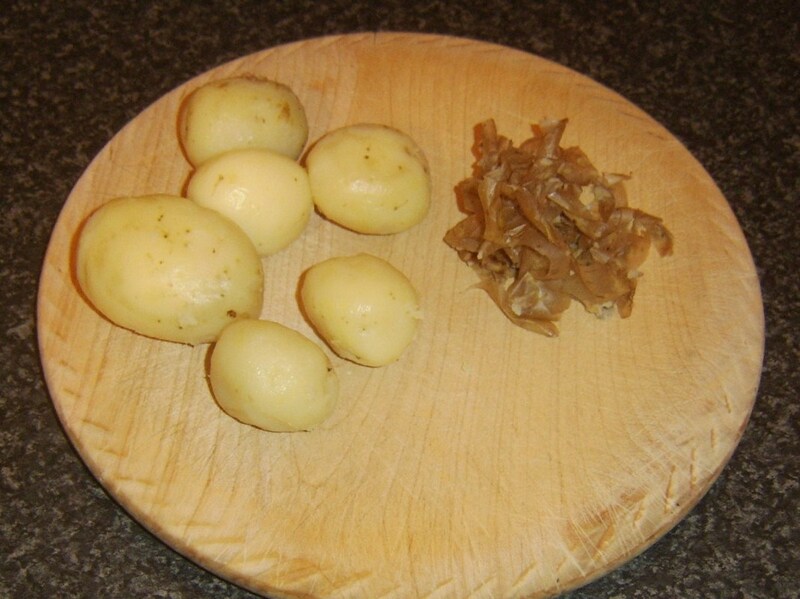 The potatoes have to be boiled until cooked and then left to cool. This is what adds to the seemingly lengthy prep time. Put them unpeeled in to a pot of cold salted water, bring it to a simmer and maintain until the potatoes are cooked - up to half an hour. 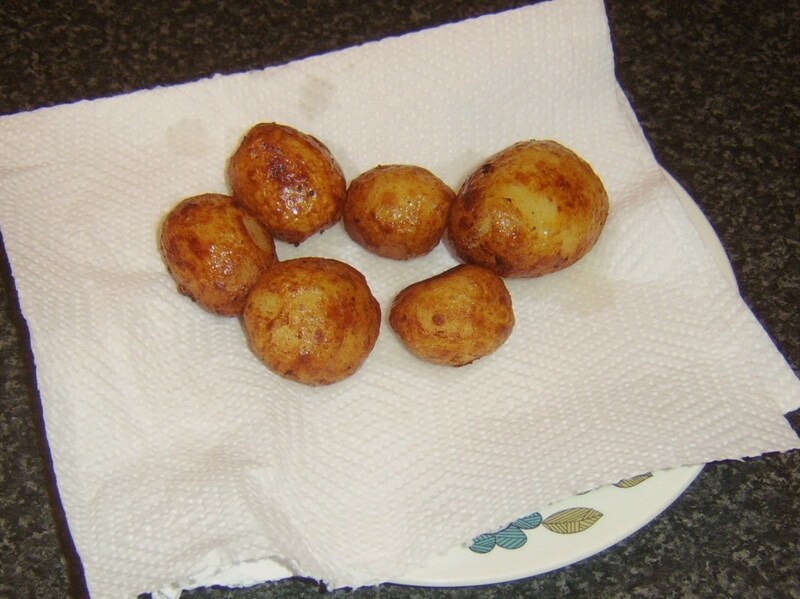 Drain the potatoes well and let them briefly steam off before covering and giving them up to an hour to cool. 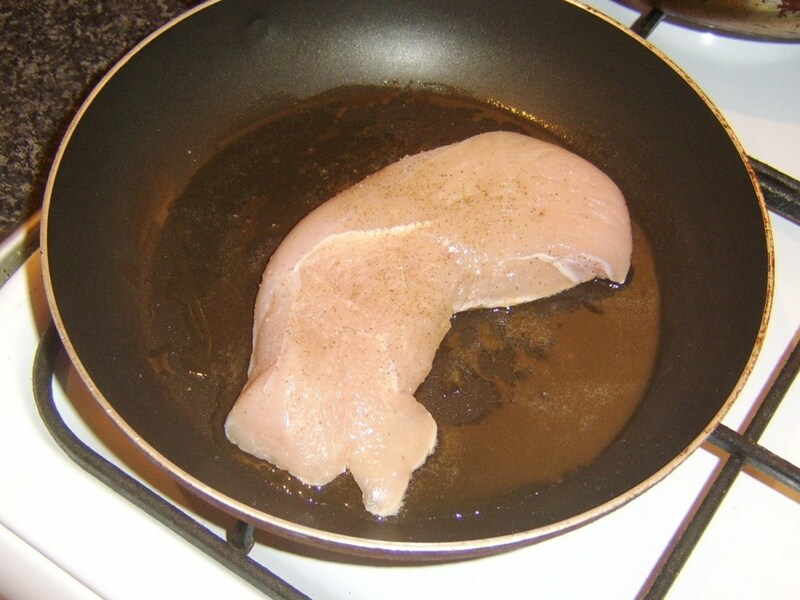 Pour a little oil in to a small frying pan and bring it up to a medium heat. Season the turkey on both sides with salt and pepper and fry over a medium heat until cooked. 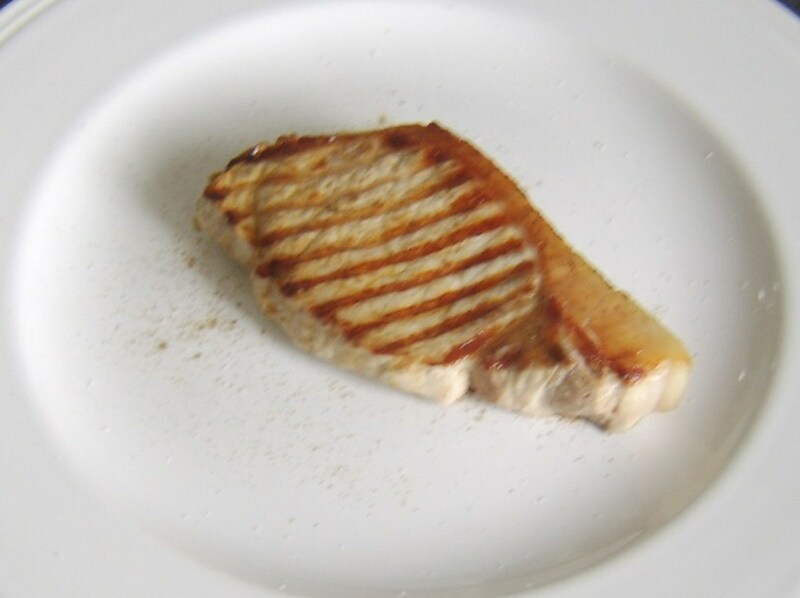 This steak took five minutes each side. When the turkey has been turned on to its second side, Peel the potatoes and start them deep frying in hot oil for about five minutes until crisp and golden. 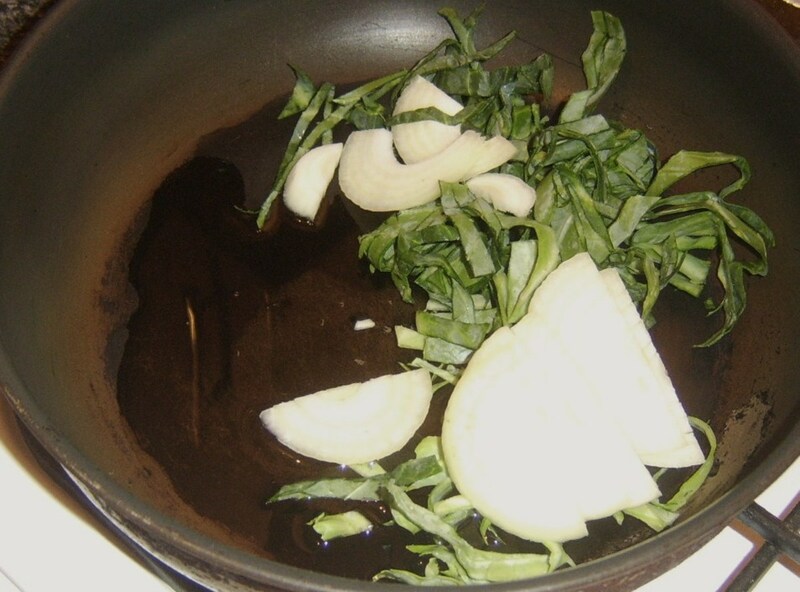 Sautee the cabbage and onion in a little oil in a second frying pan, adding the light soy sauce for the last minute of cooking. Drain the potatoes on kitchen paper. 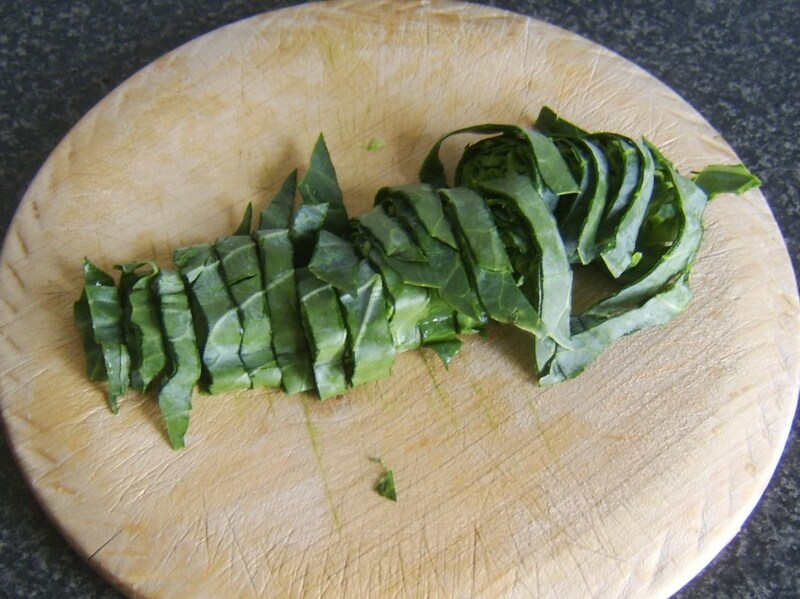 Scatter the cheese over the turkey, followed by the sage. 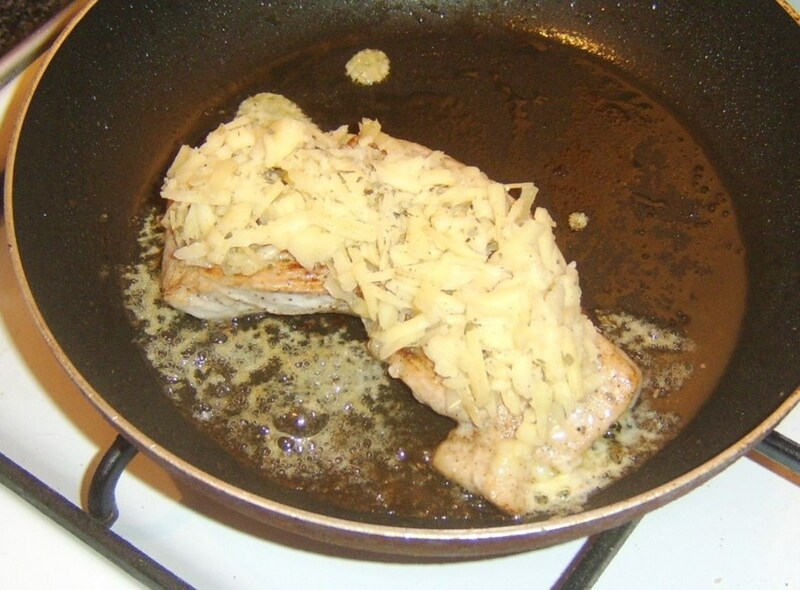 Melting the cheese fully under a grill/broiler is optional as the heat of the turkey will largely do the job fairly quickly. Plate up the meal components and serve immediately. 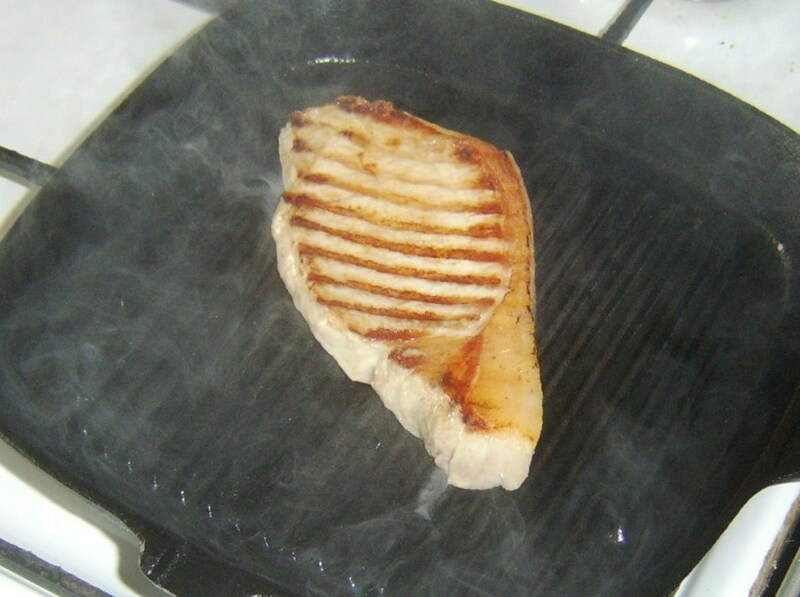 Start your griddle pan preheating to a smoking hot heat. Oil the chop on both sides with a pastry brush before frying for two or three minutes each side until done. 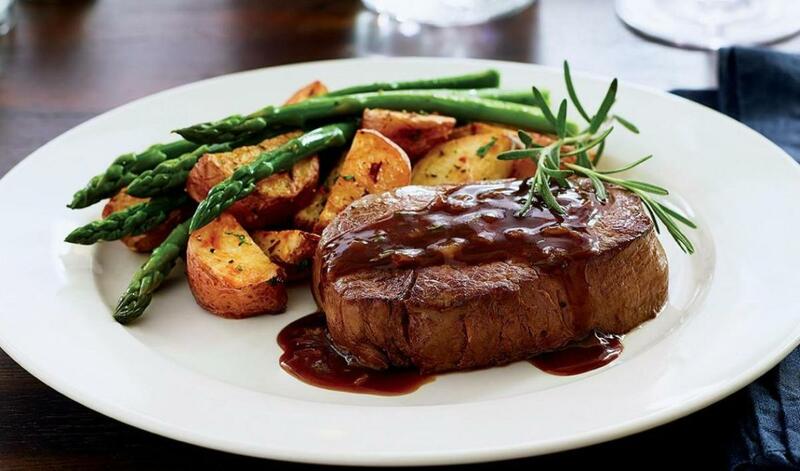 Lift to a heated plate, season with salt and pepper, cover with foil and allow to rest for a few minutes while the rest of the meal is prepared. 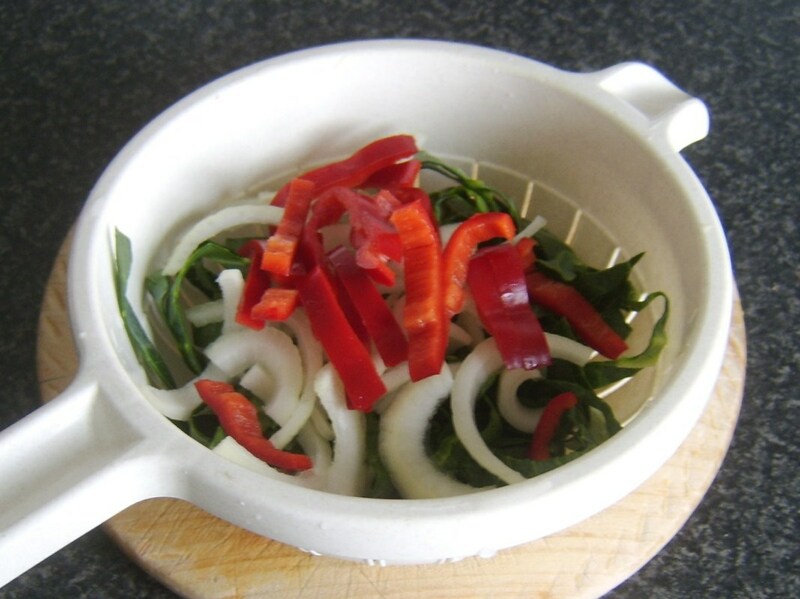 Heat a couple of tablespoons of oil in a frying pan and sautee the cabbage, onion and around two-thirds of the sweet pepper, seasoning with salt and pepper. 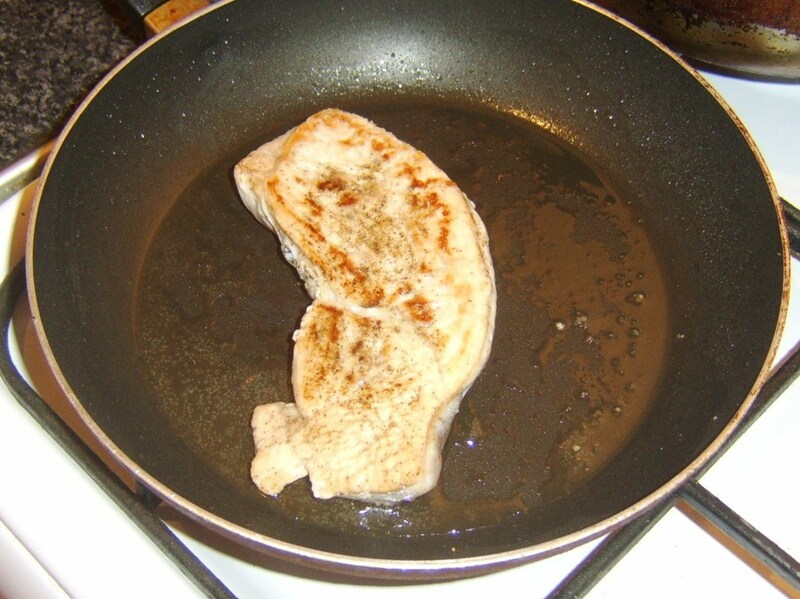 Rub a small frying pan with oil (using kitchen paper wad) and bring up to a medium to high heat. 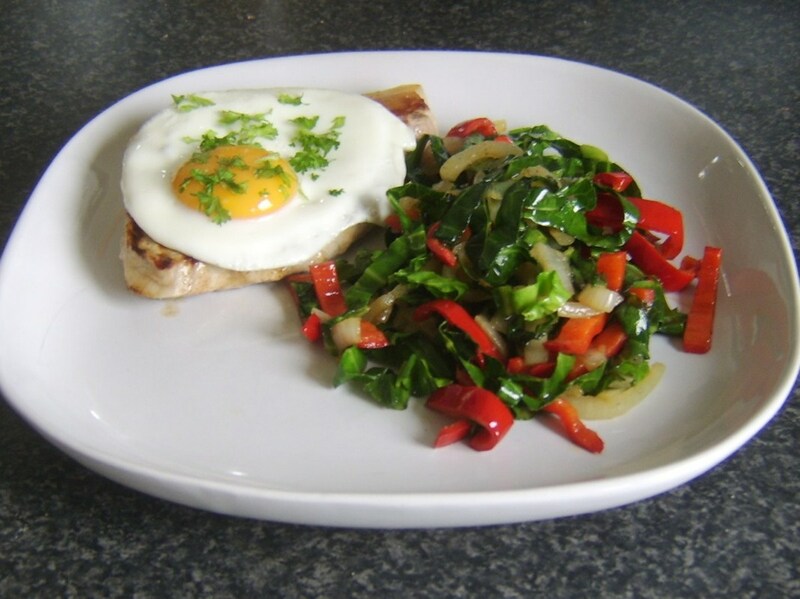 Break the egg in to a small bowl before pouring carefully in to the pan. Reduce the heat after thirty seconds or so and fry until the white is set all around the yolk. This cooks the egg perfectly sunny side up. Mix the remaining pepper with the sweetcorn. 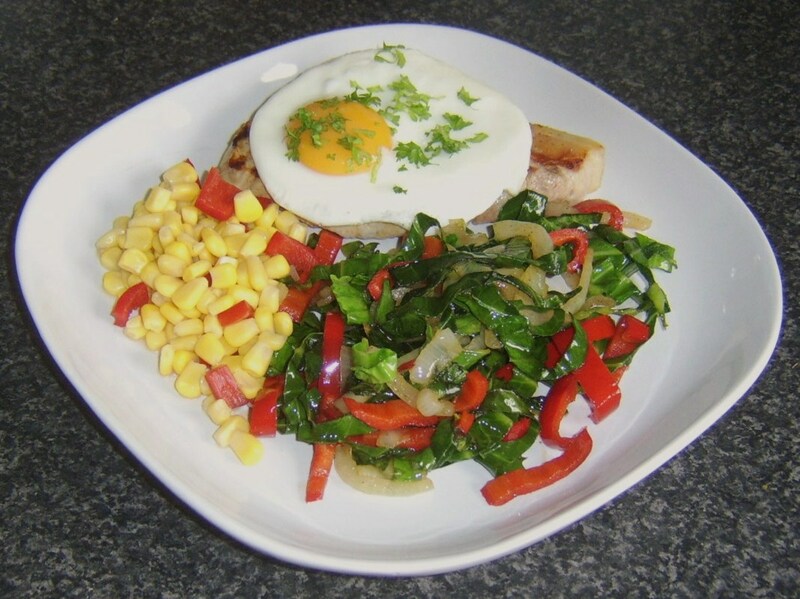 Lay the pork chop on the serving plate and the fried egg on top. Plate the remaining ingredients immediately to serve. I hope you do and enjoy them very much jcsteele. I love cabbage as well, of different types, and wish more people could realise the possibilities it affords as a foodstuff. 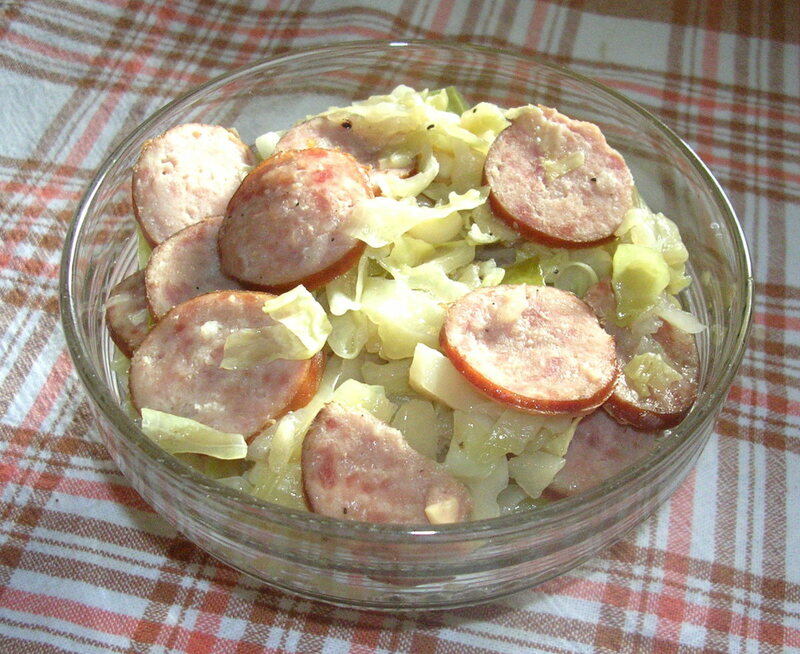 I'm from Croatia originally so in my culture cabbage is defiantly used often in recipes. I won't be surprised if i end up cooking some of these. One of those foodstuffs that has a few different names, Kristen. Glad you like the ideas and hope you manage to track it down. Thanks! Great recipes Gordon. 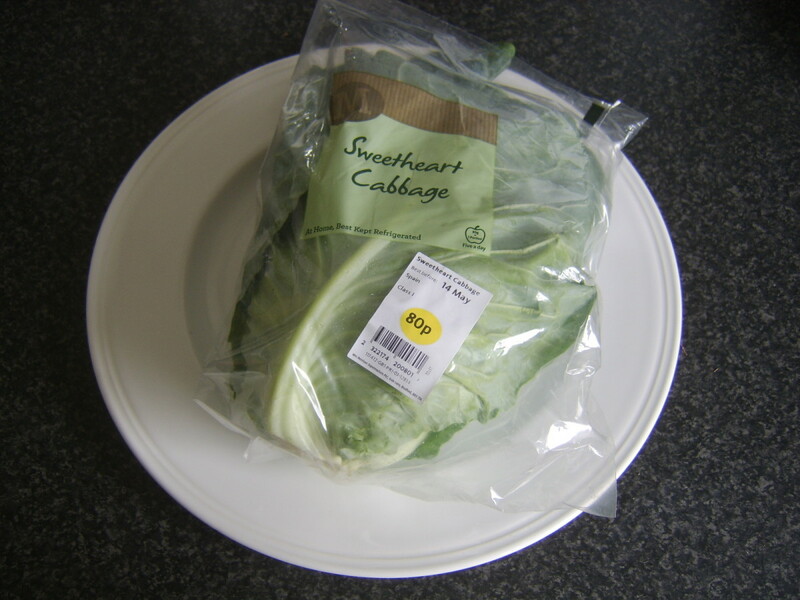 I never heard of sweetheart cabbage before. It looks interesting enough to give it a try. Voted up for useful! 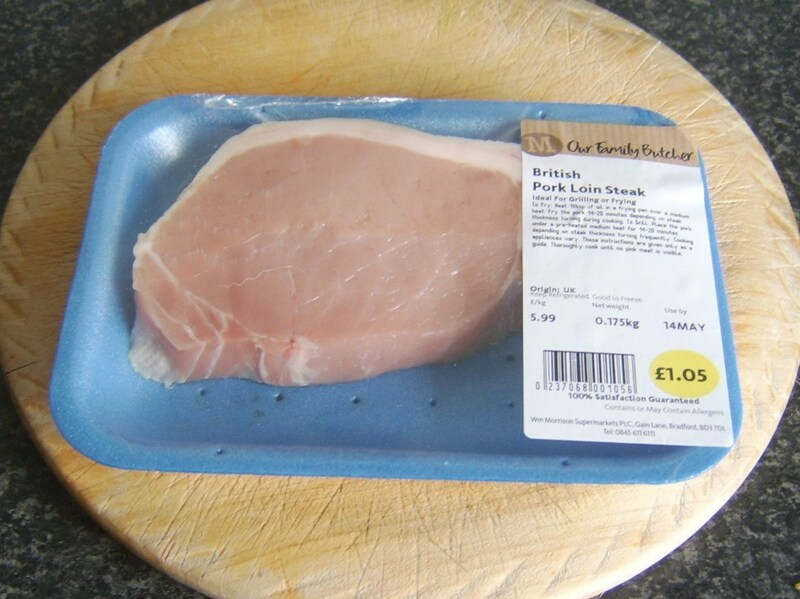 I think using it in a stir fry is a great idea, DzyMsLizzy. 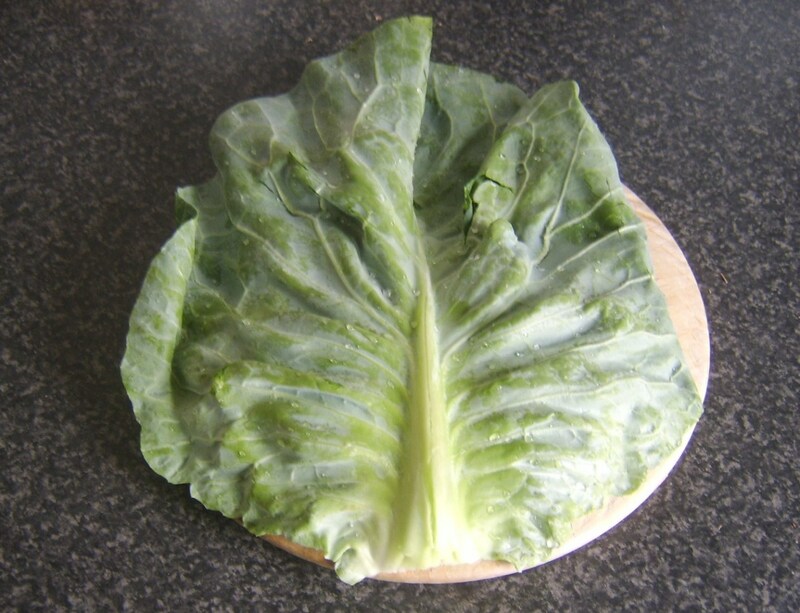 So far as I know, napa cabbage is another type of Chinese cabbage but no matter: I'm sure this would work. Thanks for visiting and commenting. Thanks, rebeccamealey. Sauteeing is my favourite way of cooking cabbage. I hope you give it a go. I love cabbage, and I never thought of sauteing it. What a wonderful idea. That plate of food looks so good. Thanks and congrats! 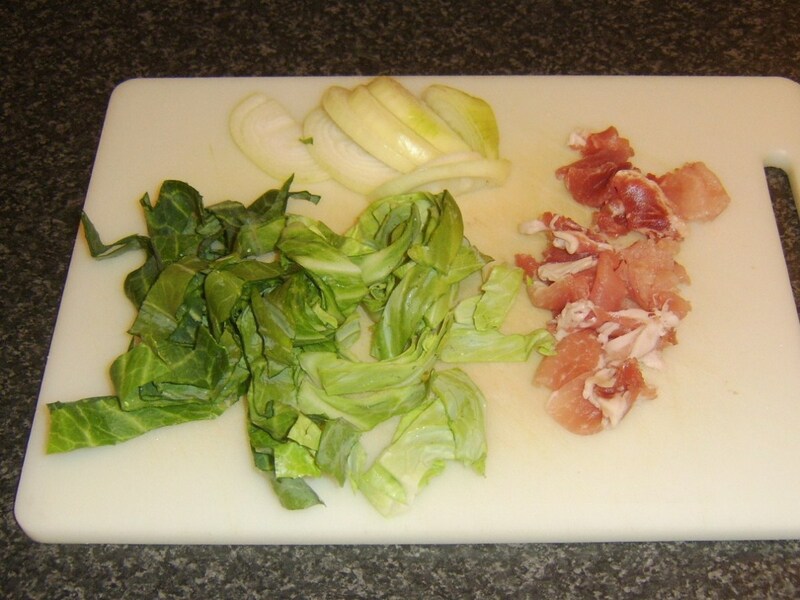 This looks as though it could be used in a Chinese stir-fry, instead of Bok Choy. As a vegetarian, I'd find it would be a good alternate or addition. I'll have to try it, if I can find any. I've never seen any cabbage in our stores outside of the standard 'head' cabbage that looks a lot like an iceberg lettuce head, or "Napa" cabbage. Perhaps "Sweetheart" is an alternate name for "Napa" cabbage? Wow, Aneegma! I am impressed and honoured that you tried one of these ideas so quickly. Thanks for visiting and for letting me know. This hub made me so hungry that I went off to make the Griddled Pork Chop with Sauteed Cabbage and Sweet Pepper using these instructions. ABSOLUTELY DELICIOUS!! Thank you and congrats on HOTD. Much deserved indeed. Voted up. 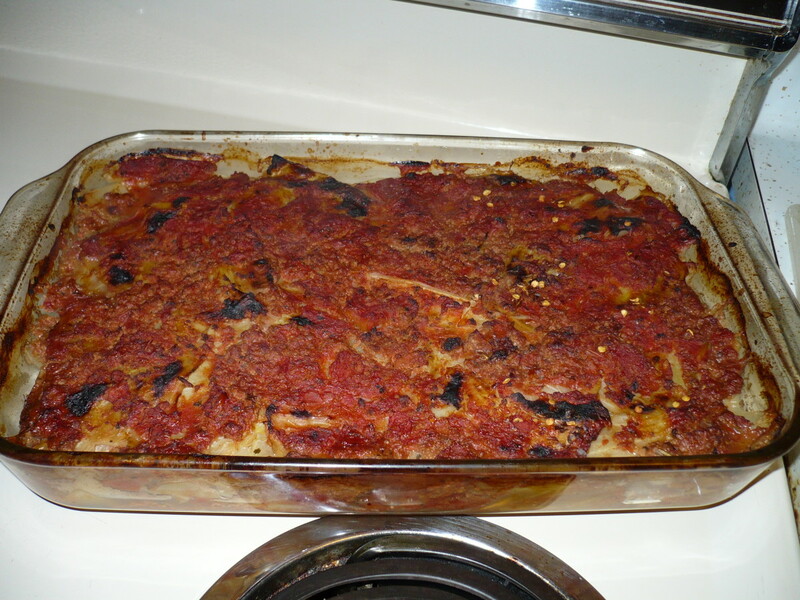 Congrats on your Hub of the Day for this sweetheart of a cabbage recipe! OMG, Gordon! I just said four days ago that this hub, with its beautiful photos, should be HOTD! AND IT IS!!! Awesome! Congrats! Glad you already like cabbage DreamerMeg and I hope this suggestion helps add a further taste dimension for you. Thanks for visiting. 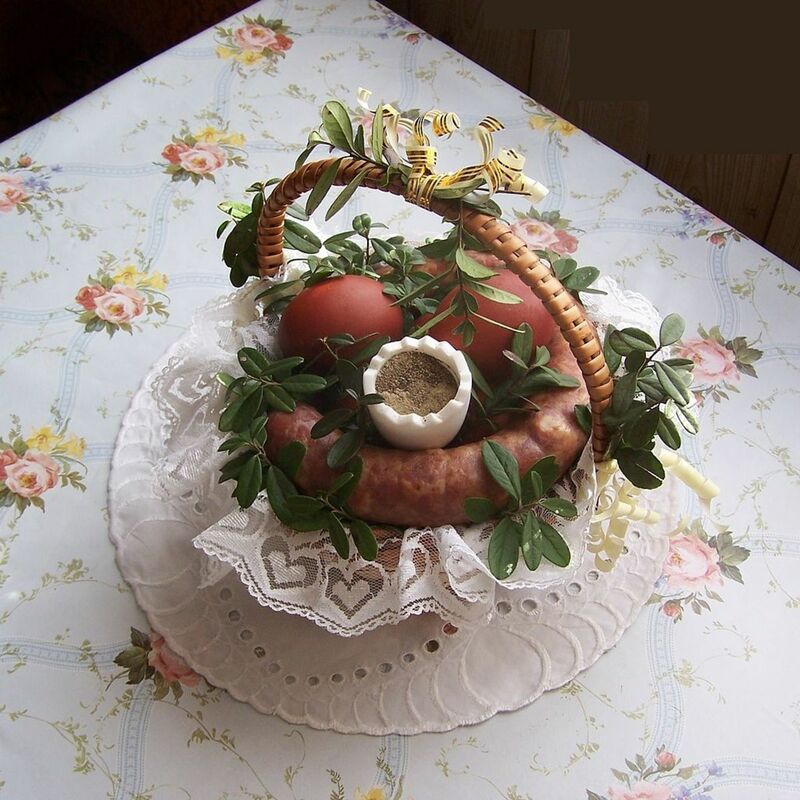 What A beautiful presentation! I'm very hungry now! The pictures are wonderful! Thanks for sharing! Voted up! Those are some REALLY great recipes. We all love cabbage anyway in this house but I haven't actually tried sauteeing it. 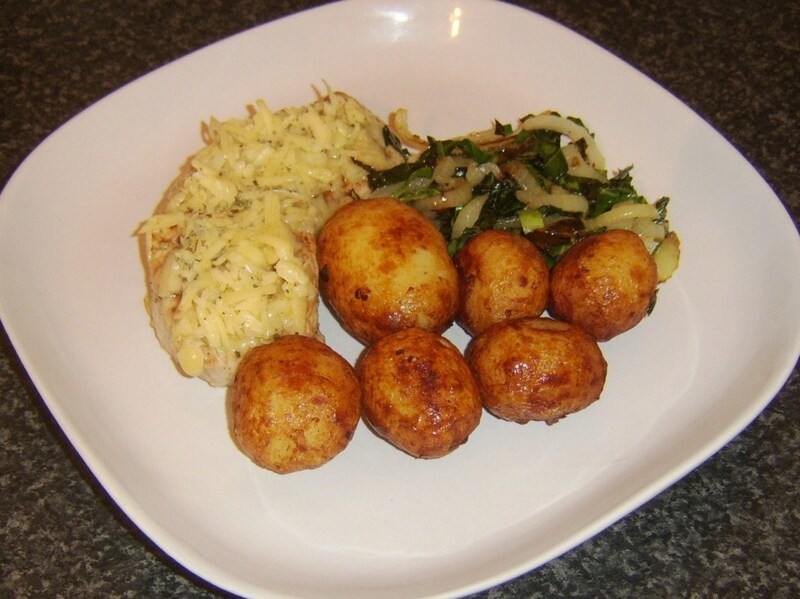 Must give that a try - feeling hungry now! I was simply placing my doubt in the hope that a reader might be able to clear my doubt. I do not address any particular person. So feel free. Not any serious matter. I'm not up on the science of this Venkatachari M, I'm afraid. Maybe a food scientist will be reading and will spare a minute to enlighten us all ? 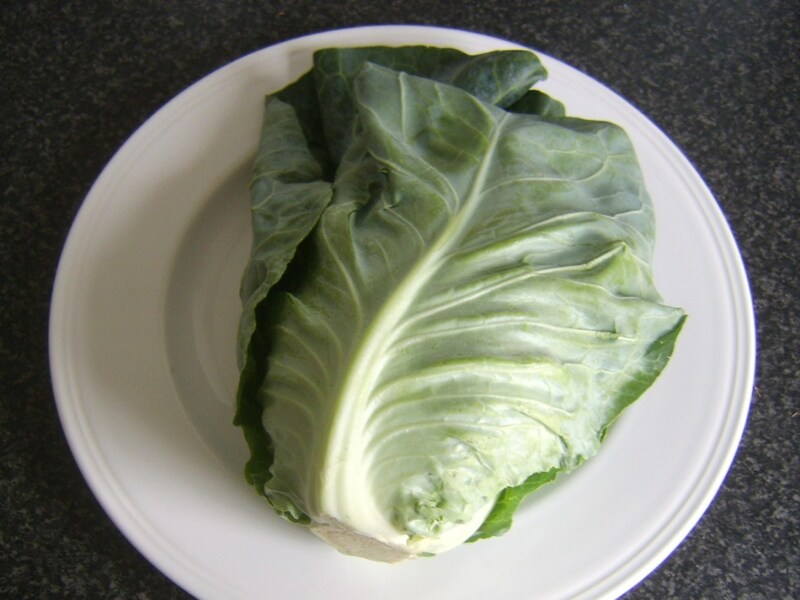 Cabbage is a very healthy green vegetable and I like it very much even though some people do not like it. Better cooking makes it so much tasty and you should not hate it. regarding keeping it fresh for many days in your fridge, I also agree to it. 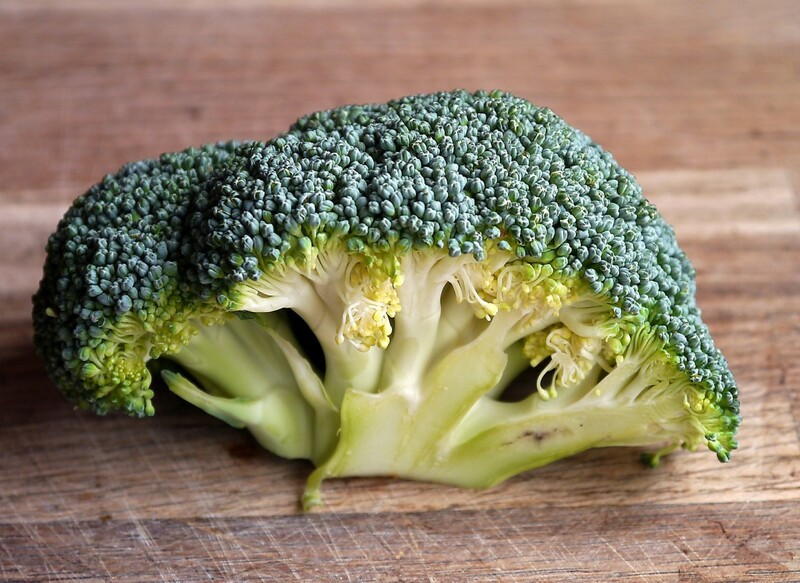 But I don't understand why many vegetables get rotten if you keep more than two days. Cabbage remains fresh even after one week. Why so? I'll be honest, it's extremely rare that I eat cabbage, much less cook with it. You may encourage me to get out of my comfort zone a little! Thanks for a great mix of recipes as always. Thank you chhosetolive and I am glad the recipes are useful to you. Good point about the freshness and very true Rochelle. Thanks for visiting. These look very good. 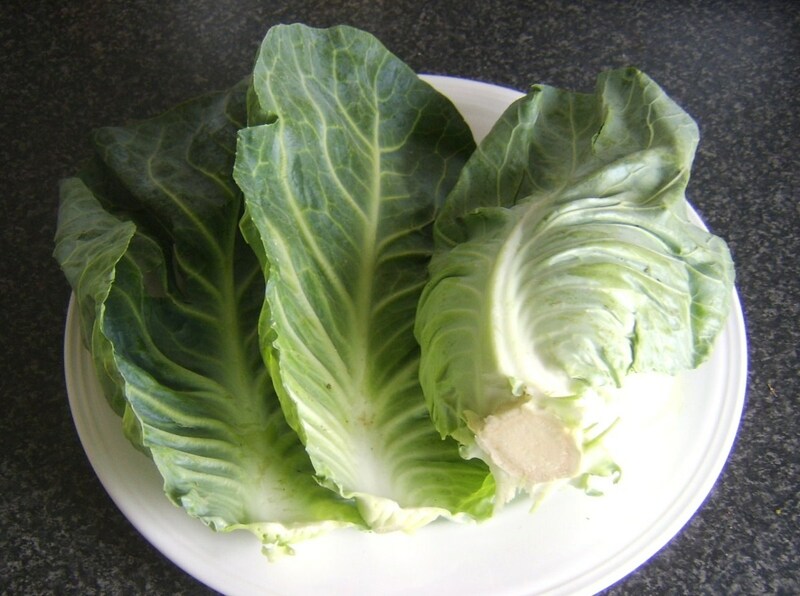 One thing I appreciate about cabbage, is that it is one fresh vegetable that is easy to keep on hand in the refrigerator for quite some time. Thanks for the ideas. Nice hub. 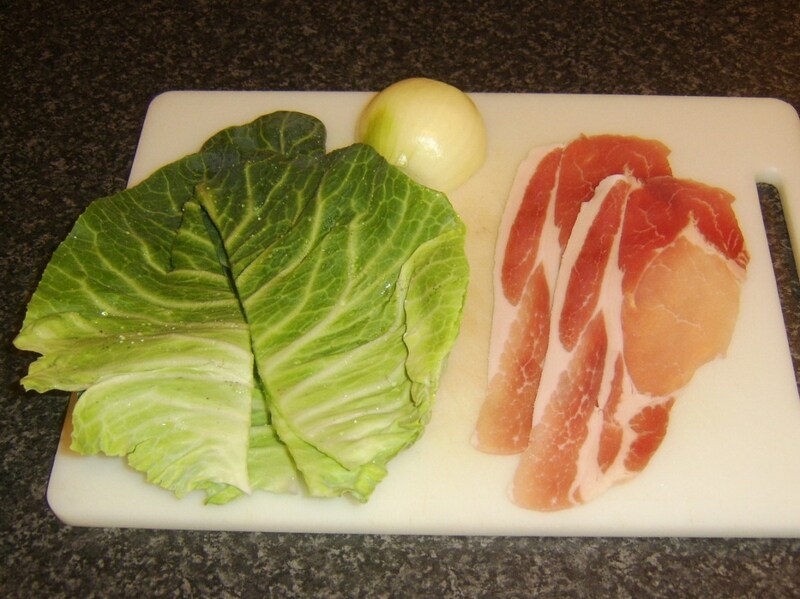 Definitely I will try cabbage in my recipes differently rather than boiling & spoiling. Though I don't eat non-veg, information in utilizing the cabbage is very useful. Voted up! You're welcome, suziecat7 and thanks for visiting. 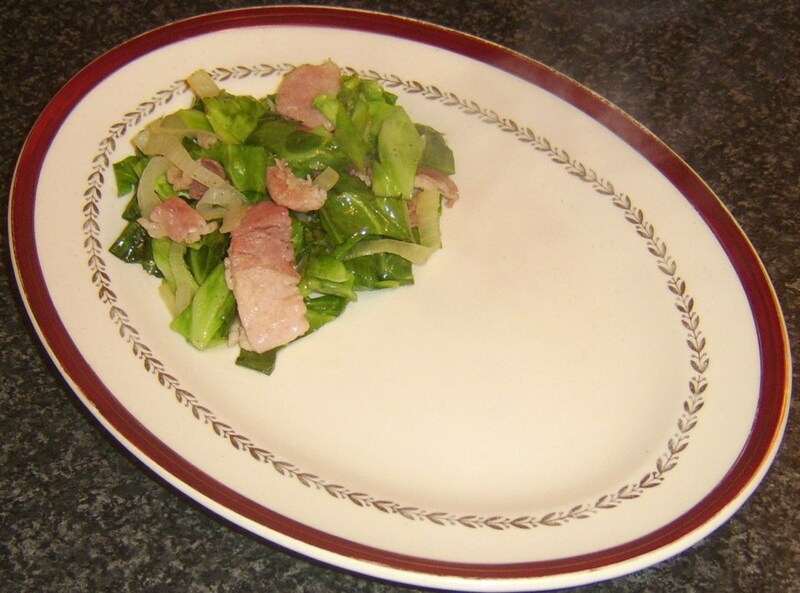 You are far from being alone in not eating enough cabbage - it's a shame it's so under-rated. Thanks for letting me know you caught up with the thumbnail option Venkatachari M. Hope you find the facility useful in your own Hubs. Yes. There they are. I had seen only the full images and not gave attention to those thumbnails. Now I can see it is very great. There are 51 images overall. Very good. I don't know about this thumbnail facility. It is very good to cover as many photos. I really like cabbage and appreciate new recipes for it. I'm pinning this one. Oh, and your photos are beautiful. This is definitely hub-of-the-day worthy!!! I really don't eat cabbage enough. Thanks for the ideas. Thank you very much for your comment, Venkatachari M. I'm glad you enjoyed the Hub and it's particularly pleasing to know that it proved interesting to a vegetarian. With regard to the names of certain foodstuffs, I'm sure you will be aware that this can be a huge problem in many instances when trying to write for a world audience. 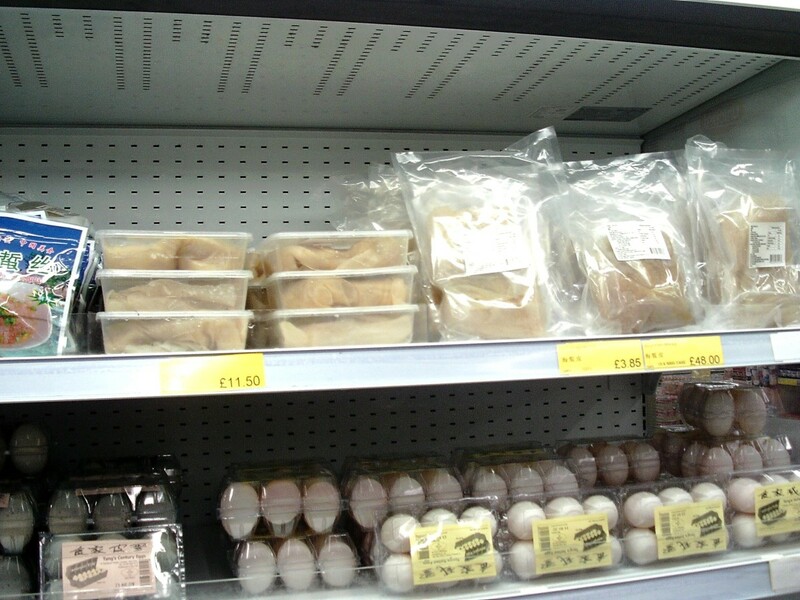 So many foods are known by different names in different regions or countries. One extreme example I always refer to is a type of fish caught in UK waters which I call a coley - this fish is known by 4 other names (that I'm aware of!) in the West of Scotland alone. This of course means that it's impossible to incorporate all variations in to any article. 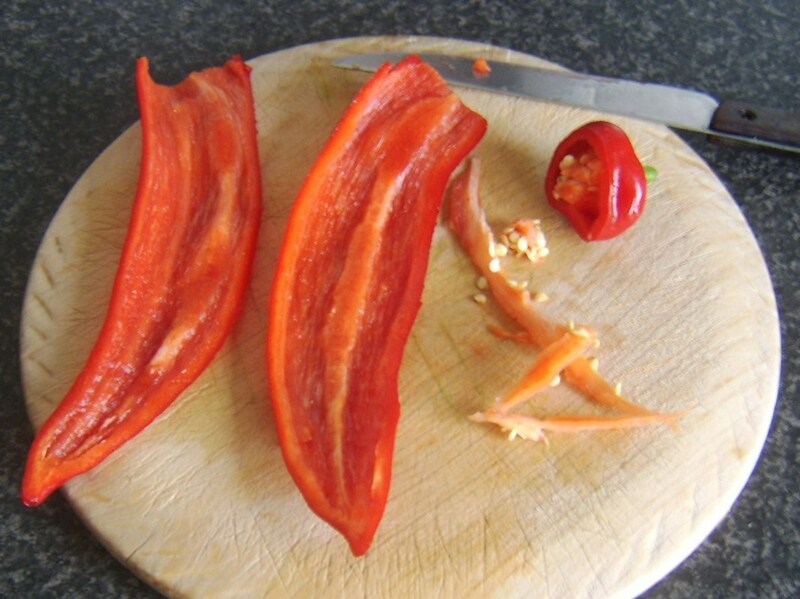 Specifically in relation to bell peppers, however, I am aware that they are very popularly known as capsicums in countries such as India, Australia and more, so given the extent of this usage, I will in the next few minutes amend this page accordingly. 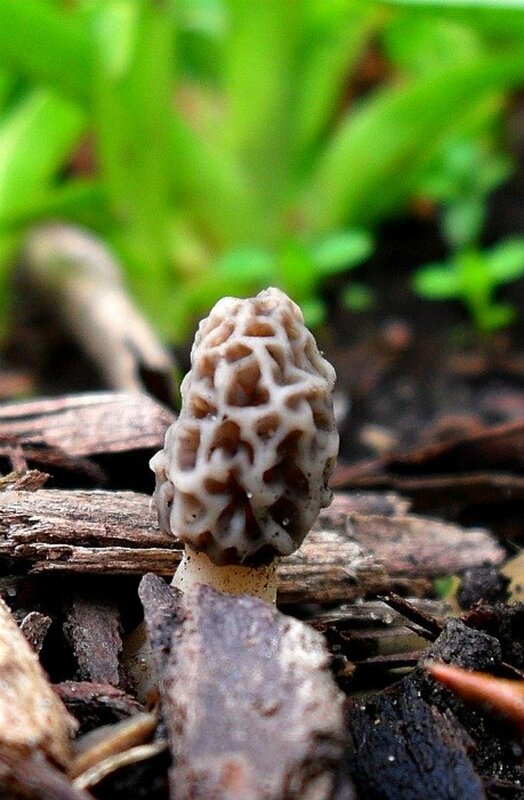 Photos are something I try to include extensively in my food articles. I do believe, however, it is possible to include too many. Given that you specifically mention the apples, I'm wondering if you're perhaps not aware of the facility to click on thumbnails in certain parts of the article to inspect many further photographs? Thanks again and I hope you give one of these ideas a try. Very interesting hub. Even though I am a vegetarian, I enjoyed the post. 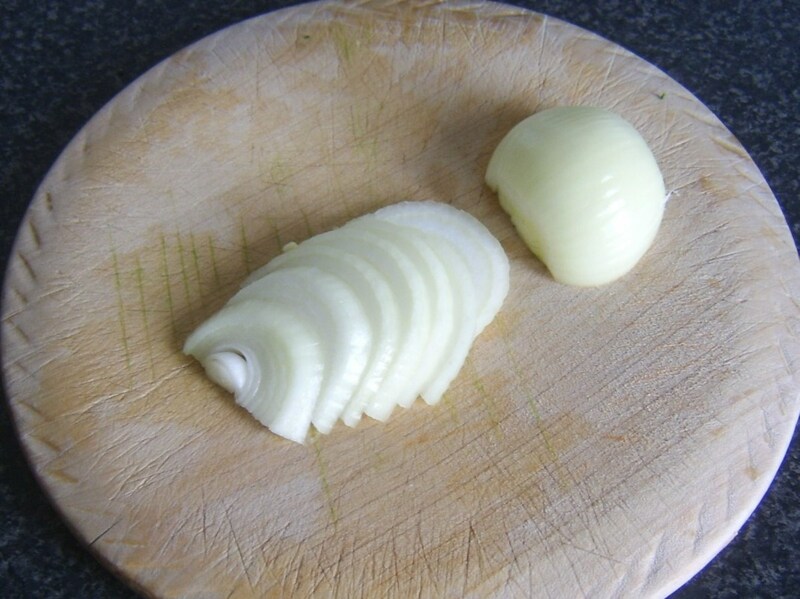 But it can have some more images of sliced apple pieces and boiling of the recipe, etc. One more thing to give importance is that people might be unaware of some ingredients or tools that you use while preparing the recipe. 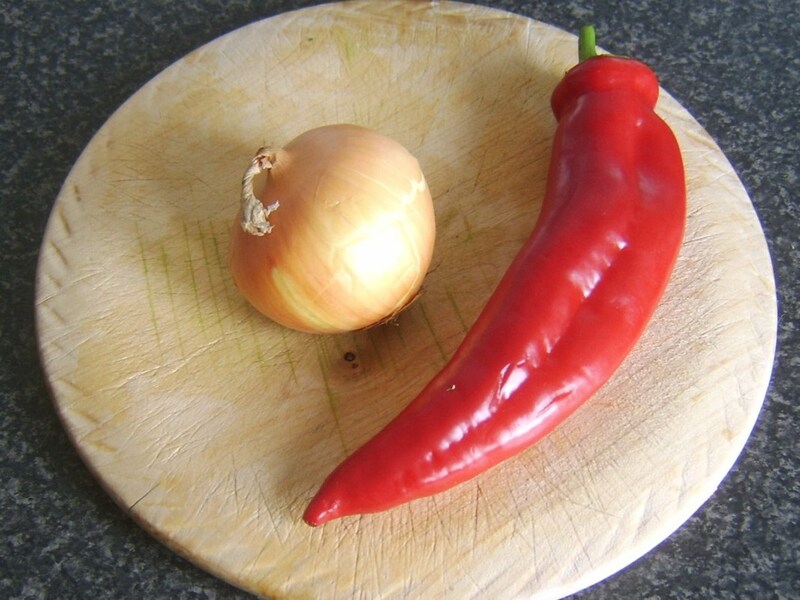 for example, I do not know what is yellow pepper and red pepper. Pepper is used by me to denote the black pepper seeds that we use. Only on checking at Google search, I came to know that they call capsicum as pepper. So you could have used the words red and yellow pepper or capsicum to be clear.